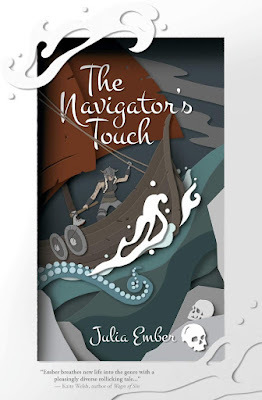 I'm thrilled to be able to welcome Julia Ember to the blog today to talk about her Seafarer Duology, The Seafarer's Kiss and The Navigator's Touch. The books are chockablock with Norse Mythology combined with a hint of fairytale retelling, the first being inspired by The Little Mermaid and the second by Peter Pan. These stories both have a wonderfully diverse cast of characters and are full of strong women and ff romance. I loved them both and want to recommend them to everyone so before I hand the reigns over to Julia let me give you a little more information about the books. 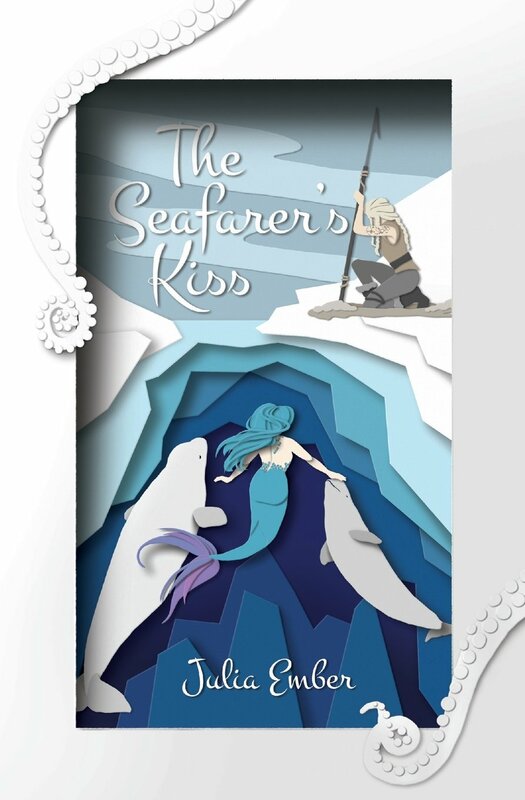 Having long wondered what lives beyond the ice shelf, nineteen-year-old mermaid Ersel learns of the life she wants when she rescues and befriends Ragna, a shield-maiden stranded on the merfolk’s fortress. But when Ersel’s childhood friend and suitor catches them together, he gives Ersel a choice: Say goodbye to Ragna or face justice at the hands of the glacier’s brutal king. Check back later today to read my full review. 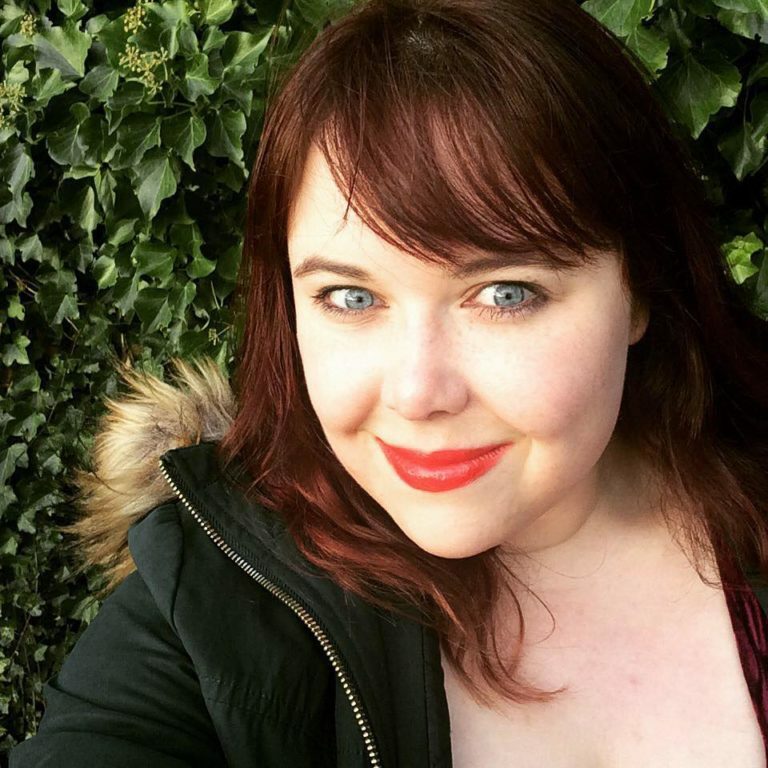 Now please give a very warm welcome to Julia who is here to talk about all things mermaid! Hello! I am delighted to be on Feeling Fictional today to share this fun post with all of you! Thank you to Sarah for hosting me! My Seafarer duology features a fat mermaid heroine, and I’ve always thought it would be amazing to dress up like my MC. But, as a plus-sized woman myself, cute mermaid-themed outfits don’t always come in my size. Representation is important to me, so for this post, I’ve only chosen items that are available in plus sizes. I hope you enjoy the look! 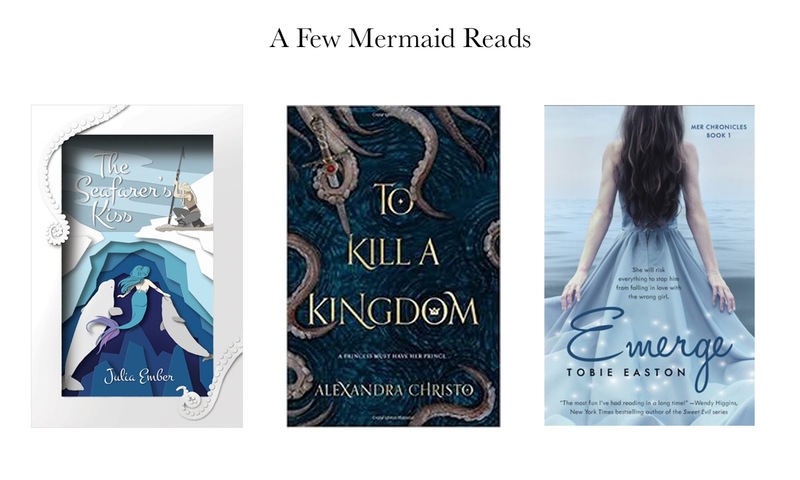 I’ve also included a few mermaid reads. To Kill a Kingdom by Alexandra Christo was a really standout book for me this year. I love the enemies to lovers trope done well, and this book was dark and delicious! I tore through it! I’ve also included Emerge by Tobie Easton, which remains a favorite of mine years after I first read it. I love the concept of mermaids living in suburbia, their community joined together by a series of underground water tunnels! 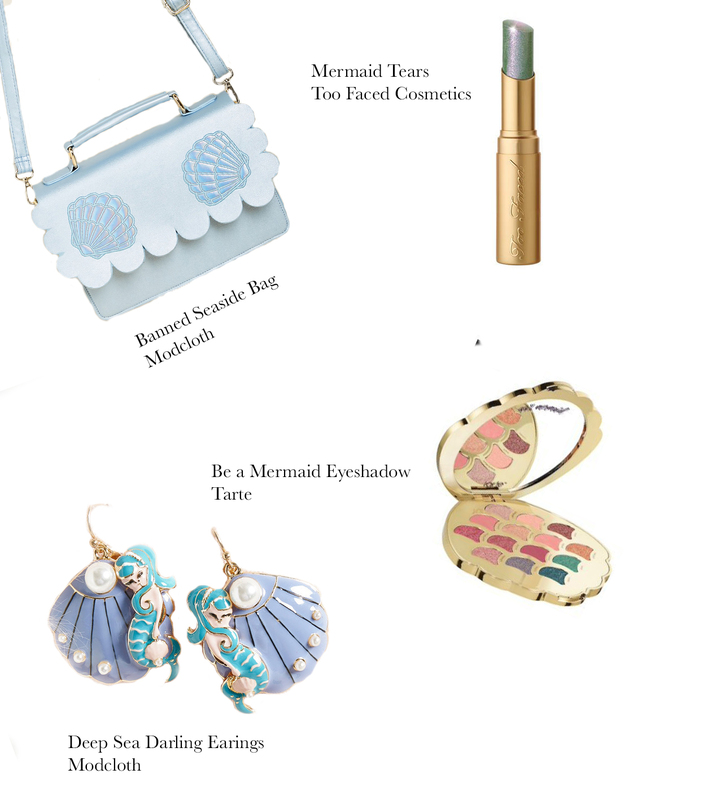 Finally, here are a few mermaid books (including, my own!) to tuck into the bag and carry with you! 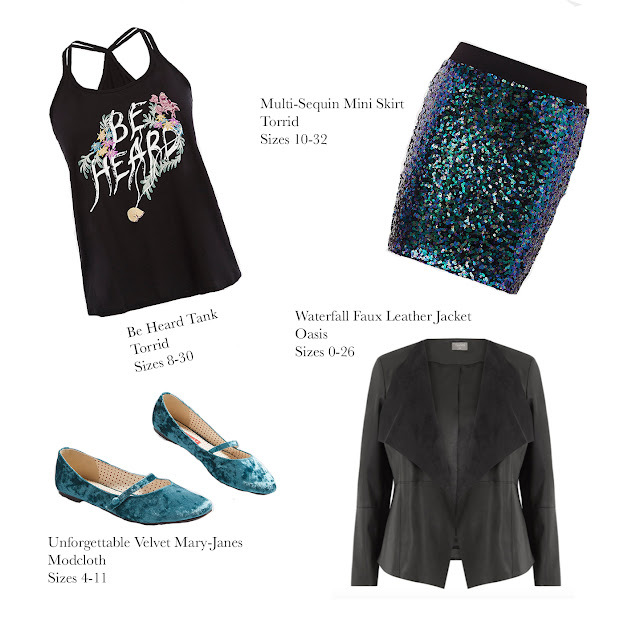 Thanks for a fabulous guest post Julia, I love that sequinned skirt and the accessories! I've already read The Seafarer's Kiss and To Kill a Kingdom so I am totally seconding those recommendations and will definitely be adding Emerge to my to read mountain. A shiver of great white sharks trailed our ship as we rowed through the Trap. Their gray fins glimmered like tiny sails in the low Arctic sun—live vessels waiting to deliver us to Valhalla should we deviate from the course and fall victim to the icebergs. On deck, another, more vicious, sort of shark waited to devour me. I could feel the hungry eyes of my crew on my back as I squinted into the distant horizon. If any of them could have navigated the narrow pass and rough seas on their own, without my magic, I’d have been sacrificed to Aegir weeks ago. My crew’s loyalty was proving a more resilient beast than their former leader. Haakon had died with my dagger embedded in his chest, but under the thick wolf pelts we donned to keep warm, most of the crew still wore the blood-red tunics of his house. The ice shelf that had been my salvation when I had been shipwrecked was far behind us. If I fell into the water here, even the mermaid who clung to the ship’s dragonhead bow wouldn’t be able to save me. Our alliance was tenuous, but this tumultuous stretch of ocean—dubbed the Trap by sailors the world over—had claimed thousands. My men wouldn’t take the risk of killing me here. As long as we sailed through dangerous waters, their rebellion would remain locked away, expressed only as sullen glances and curt nods. I lifted my arm and studied my tattoos. Our route through the icebergs etched its way across my skin. The map stretched from my bicep to the raw, scarred skin of my wrist. It stopped abruptly where the silver hook began. The blue ink of the markings shifted in time with the ship’s movements. Miniscule runes detailed ancient, underwater cities and forgotten mountains, lost to the advancing sea. A frothy wave broke over the ship’s bow, spraying us with cold water as sharp as needles. I used my remaining hand to shield my face, but Ersel laughed as water splashed her skin. While we humans shivered under our sodden animal pelts, the mermaid relished the blast of the Northern Sea. She dangled over the waves, unperturbed by the sharks circling beneath the hull. Her eight aquamarine tentacles curled around the forward stempost and her arms splayed as she embraced the ocean’s icy kiss. Her cheeks were flushed, and her topaz eyes were bright with delight. Groaning, the oarsmen strained to turn the vessel into the wind. The mast creaked as the draught caught the sail. Another wave broke over the ship’s starboard side. I stifled a yelp as the cold water soaked through my boots. I pulled the fur tighter around my shoulders and covered my lips with my hand, so the crew wouldn’t see my smirk. I hadn’t seen an iceberg, but I wanted the crew to keep believing that collision could happen at any moment. Making them feel afraid was the only way I could feel at ease. A lone figure sat at the end of the hall on a throne on a raised platform. There were no guards or servants. I would have the jarl’s full attention as I made my case. Unable to see the jarl clearly, I squinted in the low light. Then my eyes widened. No one had mentioned that the jarl was a woman. Female jarls were as rare as pearls. Jarl Honor reclined on a high-backed wooden throne with her legs crossed primly at the ankles. Her skin was deep brown, and she wore her long, black hair in tight braids. She had high, noble cheekbones and bright green eyes. Her lips were quirked in a half smile. A sable mantle was wrapped around her shoulders. Gold rings adorned each of her slender fingers. She was beautiful, commanding, and regal—everything I wanted to be. I knelt on the dais before her. She extended her hand for me to kiss her rings, then lifted a bejeweled goblet to her lips. specifically the township now held by the late Jarl Haakon’s men,” she said. My mouth fell open. Of all the reactions I’d been playing out in my mind, that I might be met with blatant apathy hadn’t occurred to me. I could picture Yarra so clearly, sitting atop Mjolnir and laughing with Lief beside her. The jarl couldn’t be so heartless as to ignore their fate. I bit the inside of my cheek. That encounter was shameful. But I had thought it would be a private shame, not something that would reach Honor’s ears. I should have known better than to think that we could pass truly unseen. I had not disciplined the crew for their actions, and she probably thought I condoned them. I would fix that later. I braced myself, sure that she would order me to leave. We spent the whole morning training on the field Aslaug had prepared. I was pleased to find that, although most of my crew came from farming or trading backgrounds, most were proficient with an axe, hammer, and sword. The men sparred as I watched them with a critical eye. Their style wasn’t graceful, but they knew where to strike. Aslaug walked among the pairs correcting stances and grips with infinite, gentle patience. They never raised their voice or became frustrated when a man failed to understand a new maneuver. It was easy to see why the jarl relied on them so heavily. Riding and archery were another story. Even Torstein sat ahorse like a sack of rocks and managed to hit the target only once with an arrow. The men had grumbled on the beach about being forced to walk inland, but I was starting to suspect that had all been for show. I was grateful to the solid, old horses who never put a foot wrong or bucked, even when the riders jerked their mouths. Riding was my domain. I’d never ridden as well as Yarra, but Mama had taught me everything she knew. I had grown up caring for warhorses. While Aslaug continued to help with melee, I barked instructions to the riders. “I’ve seen young children ride better than you!” I shouted at Torstein when he missed the target for the third pass. His roan gelding pinned back its ears. It wasn’t exactly a fair comment, as Yarra was a better rider than I was, too, but I wouldn’t admit that. By the time the sun reached its full height, I was bone-weary. I clapped my hands to get the crew’s attention, then dismissed them. They trotted off at once, racing each other in the direction of the guesthouse and lunch, tossing their weapons aside with little thought. I sighed and began collecting the discarded steel. I didn’t want the jarl to think we were ungrateful. I’d need to teach the men better respect for their weapons. I flashed them a weary smile. Aslaug had been training all morning too—and had been moving more than me—but they still walked with light-footed grace, as if they had only just risen. My crew and I had a long way to go to match the húskarl’s fitness. I gathered the horses’ reins and led them back to their stable. Eight days later, we set sail across the Northern Sea. The jarl kept her word. She outfitted ten ships with fully trained warriors and handed an eleventh ship over to me. I’d been given a new sail, designed just for me: a black war-axe on a canvas of blue inked maps. It made me proud to watch my sigil billow in the sharp ocean wind. The Sea Witch was a small, but beautifully made vessel. She was a snekke: a warship with no cargo hold and a draft so shallow she could be pulled directly onto the beach. Her decks were made of the same jewel-red wood as Honor’s longhouse. The stempost had been intricately carved to show a mermaid pressing a hunting horn to her lips. Her form was too slender and, despite the long, elegant tail winding down to the hull, she had no scales. She shouldn’t have reminded me so acutely of Ersel, when she looked nothing like the real mermaid I knew. But when I saw the horn at her lips, I blinked back tears and hurriedly bid Torstein a safe passage. On the ride from Djalsfor to the coast, I had stupidly hoped that Ersel, her cheeks rosy and her eyes bright with health, might be waiting for us at the harbor. Either she was bound to the Trickster or Loki had told her of my betrayal and she wanted nothing more to do with me. I wasn’t sure which fate was worse. I hated the idea of her being forced to carry out Loki’s wishes, but I couldn’t stand the thought of her choosing to abandon me either. I joined Honor at the helm of her flagship. The huge knarr had a special throne built on the deck for the jarl to sit and watch the oncoming waves. I sat on the bench at her feet, but faced the oarsmen. Their hand resting on their sword hilt, Aslaug stood guard behind her. They dipped their head to me, but nothing about their posture betrayed the words that had passed between us. If Aslaug had confided their feelings to the jarl, neither of them gave any indication. Shipbuilders on shore cut away the ropes binding the titan to the dock. The ship surged forward, driven by a powerful gust of wind. I was going home, at the head of an army, having forged my own agreements with lords and gods alike. I should have been elated. I would avenge my family. I was going to see Yarra again. Instead, a heaviness settled inside me as the ship left the continent far behind. When we landed on Kjorseyrr’s coast, my family would not be waiting in our house. Uncle Bjorn wouldn’t tell me how proud he was. Mama wouldn’t get the chance to scold him for putting dreams of the sea in my head as a child. Lief wouldn’t run into my arms. Ersel would not be waiting on the beach. Born in Chicago, Julia Ember now lives in Edinburgh, Scotland with her partner and their city-based menagerie of pets with names from Harry Potter. Sirius Black and Luna Lovegood the cats currently run her life. A world-traveller since childhood, Julia has visited almost seventy countries. Her travels inspire her writing, though she populates her worlds with magic and monsters. She has worked as a teacher, a wedding cake decorator and a bookseller. Julia began writing at the age of nine, when her short story about two princesses and their horses won a contest. In 2016, she published her first novel, Unicorn Tracks, with Harmony Ink Press. It also focused on two girls and their equines, albeit those with horns. She has subsequently published three further works for young adults. THE NAVIGATOR’S TOUCH is the sequel to THE SEAFARER’S KISS, which was released by Interlude Press in May 2017. It was heavily influenced by Julia’s postgraduate work in Medieval literature at the University of St. Andrews. Julia Ember is represented by Eric Smith at P.S. Literary. Connect with the author at Julia-Ember.com, on Twitter @jules_chronicle and on Facebook at facebook.com/juliaemberwrites.